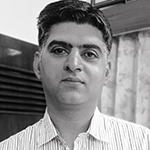 Vikas Malik has completed 13 years of work in the field of CSR audits including Social Audits and Security Audits. He started his career in leading 100% home textile EOU and represented the company for over 350 audits related to Social and Security audits. He has worked with 3rd party audit firms including Bureau Veritas, CPS India and ARCHE Advisors for over 8 years. In this period, he has conducted over 750 audits covering garments, footwear, jewelry, paper, electronics, stationery, hard goods, and consumable products. Vikas Malik’s professional qualifications include SA800 Basic Auditor Course (SAI), the Auditing for Fire Safety in the SA 8000 and BSCI System (SAI), QMS Lead Auditor course ISO 9001:2008 (Moody ICL), Master of Business Administration – International Business (Amity Business School – NOIDA) and Bachelor of Business Administration (DAV Institute of Management – Faridabad).